Peter Stubbs is a retired soli­citor who has developed an interest in naval his­tory, he has given 2 talks pre­vi­ously to the Club. The his­tory of the British Navy during WW1 is a big sub­ject and his talk is in two parts and this report refers to the first sec­tion. Until the 16th cen­tury war­ships had been essen­tially for trans­port­ing sol­diers for hand to hand fight­ing. Now wooden ships with gun ports and muzzle loaded guns on 3 decks were built and 250 years later in the time of HMS Victory, war­ships had changed little. 95 years later HMS Warrior was launched with iron clad­ding to a timber frame with steam engines but still with 3 masts and muzzle loaded guns. The British Navy was com­pla­cent and set in its ways. In 1900 it was like a rich old man, swollen with self-confidence with memor­ies of past glor­ies and little regard for modern trends. There was much emphasis on smart­ness and little on train­ing. In 1889 the German Chancellor Bismark stated “I see England as an old and tra­di­tional ally. No dif­fer­ence exists between England and Germany”. In England, France was the tra­di­tional enemy. The Kaiser was very jeal­ous of Britain’s dom­in­ance of the seas and in 1897 he made Tirpitz Secretary of State of the Imperial Navy. He was a bril­liant admin­is­trator and began to increase the German Navy by 38 battle­ships, 20 armoured cruis­ers and 38 light cruis­ers. The British Navy at this time had over 900 ships. In 1904 Admiral John Fisher became 1st Sea Lord. He recog­nised the threat the new German naval policy rep­res­en­ted and thought that war was inev­it­able. He removed 150 obsol­ete ships from the fleet and planned for modern replace­ments. He cham­pioned the devel­op­ment of the sub­mar­ine and inven­ted the concept of the modern des­troyer. He was the ori­gin­ator of the Dreadnought battle­ship. No other ship could com­pete with her and Britain built 35 of them. Seeing the Dreadnought, Germany halted con­struc­tion of its ships and ordered new designs to be built. The Battleship Race was on. The British Navy went to war on 4th August 1914 with 609 fight­ing ships includ­ing 29 Dreadnoughts and battle cruis­ers to Germany’s 17 equi­val­ents. It soon became clear that sea power must now con­tend with mines, tor­pedoes and sub­mar­ines. At this time 60% of our food and other com­mod­it­ies were impor­ted. 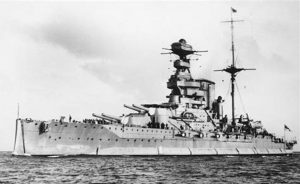 The object­ive of the German Grand Fleet was to break out from the North Sea and to attack Britain’s mer­chant ship­ping. 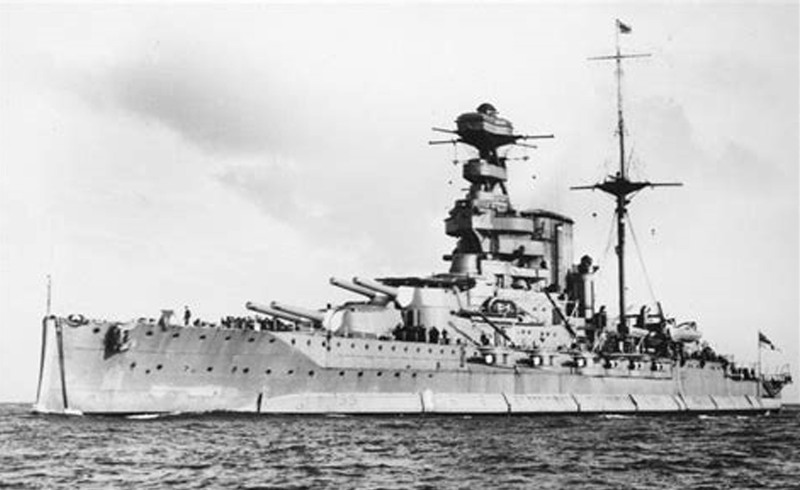 The Grand Fleet under Admiral Jellicoe was sta­tioned at Scapa Flow to pre­vent this. Britain’s block­ade covered the whole of the west­ern approaches and applied to all ships bound for Germany. This had an ever more dam­aging effect on German pro­duc­tion and living stand­ards. At this early stage in the war inter-ship com­mu­nic­a­tion was poor. In the battle of Heligoland Bight it was repor­ted “Our battle cruis­ers were scattered by and made viol­ent attempts to sink a squad­ron of our own sub­mar­ines. Our light cruis­ers sent in to sup­port were in two cases thought to be enemy ships by our des­troy­ers and in another case two light cruis­ers chased two tor­pedo boats each sup­pos­ing the other to be the enemy.” Despite all this Commodore Tyrett won the battle and this had a sig­ni­fic­ant effect on future German policy that became more cau­tious. Peter’s talk covered sev­eral naval battles in the south­ern hemi­sphere includ­ing the Battle of Port Stanley and the sink­ing of the Scharnhorst and the Gneisanau. The second part of the talk will be more focused on war in the north­ern hemi­sphere. We eagerly await Peter’s con­clud­ing talk in what is an intriguing insight into our recent his­tory that few of us have much know­ledge of. Steven Gay has an encyc­lo­paedic know­ledge of the English rail­way system and is a reg­u­lar speaker at the Club. His talk about the Woodhead Tunnels is the 19th jour­ney he has taken the Club on. This was a pho­to­graphic jour­ney that star­ted on the Trans Pennine Trail to the east of Hatfield. The Trail is on the bed of the old Manchester, Sheffield and Lincolnshire Railway. 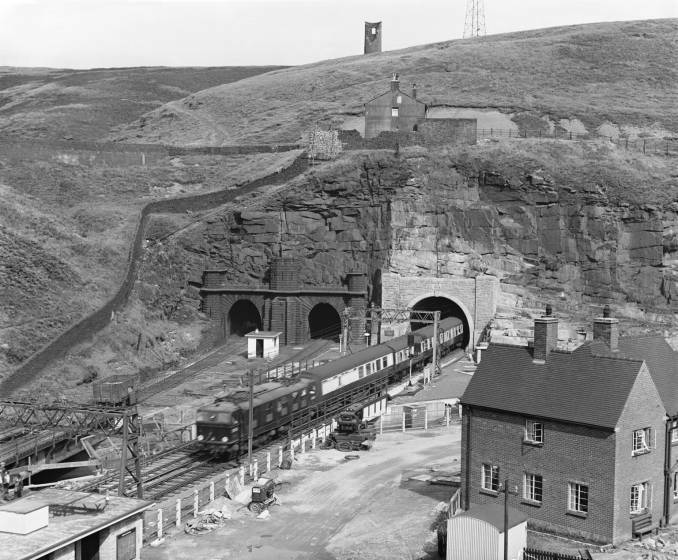 In 1837 work began on the Woodhead 1 tunnel. This was a dif­fi­cult tunnel to con­struct using hun­dreds of nav­vies and was only wide enough for a single track. In 1845 the tunnel was opened for pas­sen­ger traffic and was the main link between Manchester and Sheffield. It brought coal from the South Yorkshire Coal Fields to the Lancashire indus­trial belt and was soon found to be inad­equate for the traffic. It was always thought that a second tunnel might be needed. 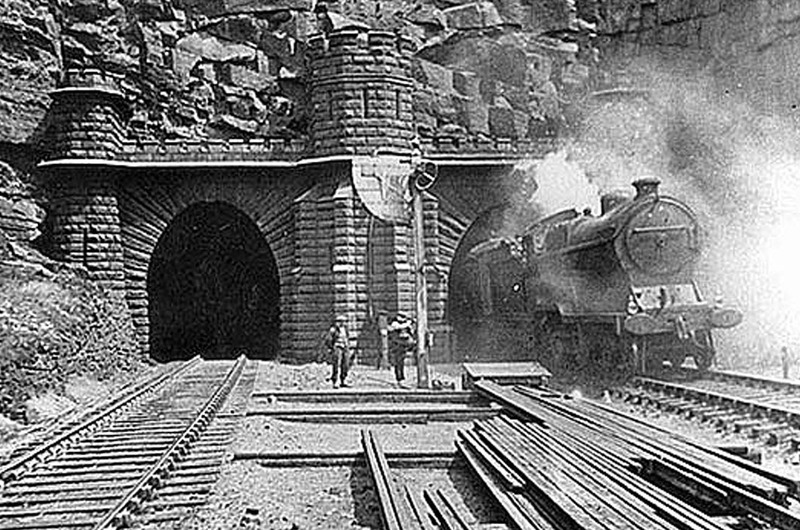 A second tunnel run­ning along­side Woodhead 1 was cut and in 1853 Woodhead 2 was opened allow­ing trains to flow in both dir­ec­tions without delay. The Trail takes the public to the sta­tion at the west­ern end of the tun­nels and then diverts over the top of the tun­nels through glor­i­ous scenery look­ing down on the reser­voirs along the Woodhead Pass. Steven always adds many inter­est­ing asides often promp­ted by the pho­to­graphs. One such was when he noticed smoke rising from a chim­ney at the end of what he thought was a row of derel­ict rail­way men’s cot­tages in a very isol­ated part of the moor above the tun­nels. He went up to the door and gave it a knock. The occu­pant had worked on the rail­ways for over 50 years and a friend­ship star­ted that lasted for years. The tun­nels were over­used with 250 trains each way using them each day. 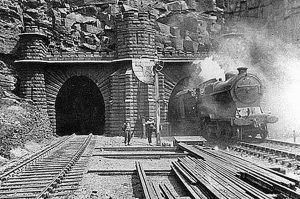 In 1953 a new tunnel was opened. Woodhead 3 was designed for the first elec­tric rail­way in the UK and the other tun­nels were closed. In 1970 this line was closed to pas­sen­ger traffic and in 1981 the line was closed com­pletely. Woodhead 1 was then used to accom­mod­ate elec­tric cables. Woodhead 1 & 2 were finally sealed and new cables were laid in Woodhead 3. It is a moot point whether any of the tun­nels might find a use as a part of the regions trans­port system in the future. As always the pho­to­graphs and the dia­logue were excel­lent. Clyde Binfield is the Emeritus Professor of History at the University of Sheffield with sev­eral books to his name. He is also a very accom­plished speaker with both a sense of humour and great curi­os­ity. Perhaps his love of an artist/architect that was so anti-establishment and a hero of the work­ing man should not come as a sur­prise. 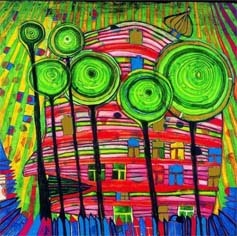 As an artist he was very much influ­enced by the Norwegian painter Edvard Munch but he also had strong “green” sym­path­ies. He had an aver­sion to the uni­form­ity of straight lines and described modern archi­tec­ture as degen­er­ate. In 1952 he held his first major exhib­i­tion in Vienna. The main theme in his paint­ings is the recon­cili­ation and har­mony of man­kind with nature. At the age of 55, he became embroiled with archi­tec­ture. 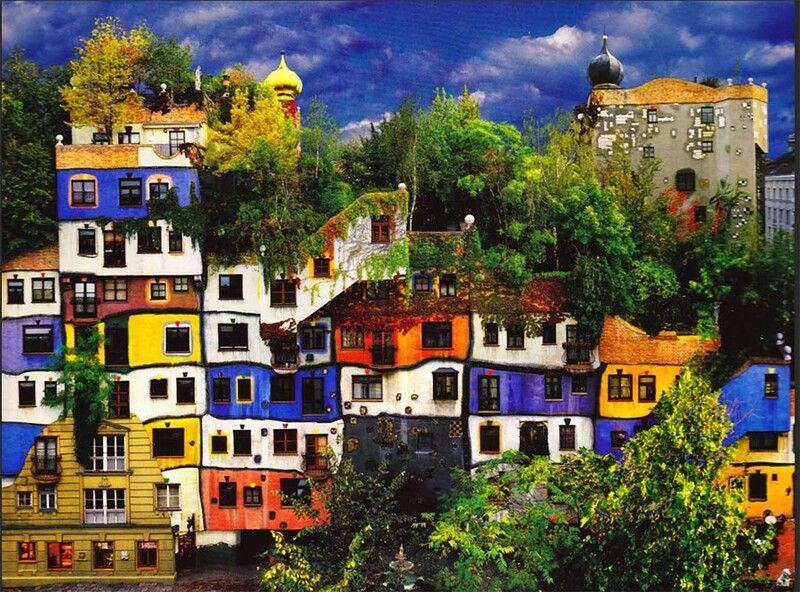 The above pho­to­graph is a block of social hous­ing now called Hundertwasserhaus. 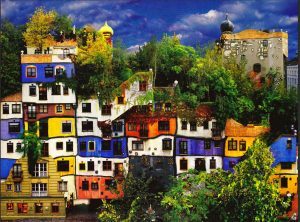 It is an import­ant build­ing on the Vienna tour­ist cir­cuit and is very pop­u­lar with its occu­pants. It’s a “make over” of an exist­ing block whose ori­ginal wall can be seen exposed in the left corner. He appears to have got on well with crafts­men. 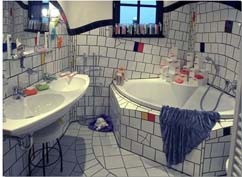 The pho­to­graph of a typ­ical bath­room shows how the build­ing has been trans­formed. In 1959 he became an Associate pro­fessor at Hamburg University. In 1968 he was lec­tur­ing about the 3 skins. The 1st. skin is the naked skin, 2nd skin is our clothes and 3rd skin is the home we live in. At times he would be naked whilst deliv­ery these lec­tures. Besides paint­ings and build­ings he was famous for his poster and stamp designs. He made his own clothes and had a pink hat! He trav­elled extens­ively and spent his later years in New Zealand where he had dual cit­izen­ship and he died whilst cruis­ing on the QE2 in February 2000. This is a spell bind­ing talk about a man that simply oozes cre­ativ­ity and refuses to be con­strained by rules. Peter Styring became Prof. of Chemical Engineering and Chemistry at the University of Sheffield in 2007. He gradu­ated at Sheffield then worked at Hull and New York State uni­ver­sit­ies. He is an expert in Carbon Capture & Utilisation (CCU). 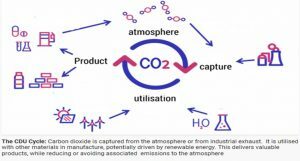 He is the author of “Carbon Capture and Utilisation in the Green Economy” and is Chair of the CO2Chem Network. His talk began with provid­ing evid­ence that it is CO2 that is the major con­trib­utor to global warm­ing by show­ing a series of “hockey stick” graphs show­ing the global effects of vari­ous sus­pec­ted con­trib­ut­ors. Deforestation has noth­ing like the effect that it is com­monly thought have and simply plant­ing more trees will not in itself solve the prob­lem. Similarly, the Ozone layer has only a small effect and aer­o­sols have a neg­li­gible effect. He then moved on to how CO2 is a “green­house gas” and a cli­mate change accel­er­ator. A prob­lem is that fossil fuels take mil­lions of years to create and seconds to des­troy. He is con­vinced that the gen­er­a­tion of fossil fuel use for our elec­tri­city, heat­ing, indus­trial pro­duc­tion and trans­port is det­ri­mental. To mit­ig­ate against this requires: Government policy; life cycle aware­ness & sus­tain­ab­il­ity; cre­ation of new chem­ic­als, pro­cesses and indus­tries. The top of the pyr­amid is to use no new fossil fuels and the lowest level is to bury the prob­lem. At the IPCC con­fer­ence in Korea we received a dire warn­ing “to reduce the rate of global warm­ing to a max­imum of 1.5 0C per annum and we have only 10 years to save the planet”. Peter is con­vinced that legis­la­tion alone is not the answer and solu­tions that create a “profit” are a prac­tical approach. 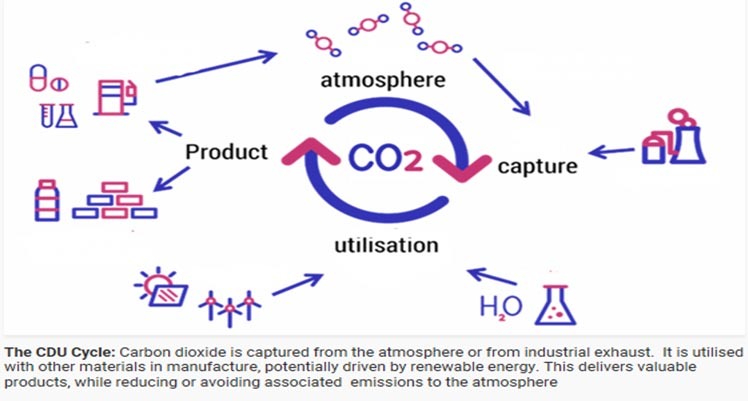 Taking inspir­a­tion from Sir Fraser Stoddard, he believes in using CO2 to make things. Peter Medawar speaks of “some­thing to be clever about” to create a world where there is no sur­plus CO2. Peter covered many aspects of CO2 util­isa­tion and in par­tic­u­lar, vari­ous forms of trans­port. He thinks there is a big future for the mass pro­duc­tion of Dimethyl Ether. This liquid is a sub­sti­tute for diesel and is already used for some goods vehicles in Canada and the US. For a small cost, diesel engines can be con­ver­ted to use DME with no emis­sion pol­lut­ants. This is a much better method of cap­tur­ing CO2 and prob­ably much less costly than stor­ing it under the North Sea. This was a spell bind­ing talk given by an inter­na­tional expert that cuts through some of the mis-information that is around today. Ian Morgan has given a number of talks to the Club. His pas­sion is his­tory. He has pub­lished books on his­tor­ical and crime sub­jects, made many appear­ances on local radio and is a guide for some English Heritage prop­er­ties. His talk star­ted with the earli­est laws still in use. Until recently the 1266 Assize of Bread and Ale was the oldest but it was updated due to met­ric­a­tion. The oldest is now the 1267 Assize of Distress. This meant that a person suf­fer­ing dis­tress from another should take the matter to the Crown Court and not just take their own revenge. Until the 1840’s there was not a police force as we think of one. Local people would pay into a Felon Society to cover the costs of main­tain­ing a con­stable. A form of pro­tec­tion was the “hue and cry” and parish­ion­ers must help to detain a felon if not the parish may have to pay com­pens­a­tion to the victim. At this time pris­ons were essen­tially to hold people before their trial. The pun­ish­ment for approx­im­ately 285 crimes was hanging or quite likely trans­port­a­tion to the colon­ies. None cap­ital pun­ish­ments were flog­ging, birch­ing, pil­lory, stocks, duck­ing stool, scold’s bridle or branks. It was only later that hard labour and tread­mill type pun­ish­ments were used when crim­in­als and debt­ors were incar­cer­ated for long peri­ods. Branding 1.5 “ high let­ters onto crim­in­als was common to sig­nify the type of crime com­mit­ted. Birching on a birch­ing stool was com­monly 12 lashes and was stopped in England in 1948 but con­tin­ued in Jersey until 1955. Public flog­ging with a cat ‘o nine tails was abol­ished in 1830’s although it con­tin­ued in pris­ons and died out in 1930’s. A pil­lory and or stocks were common in many vil­lages and all towns. One could be pil­lor­ied for many offences and might be ser­i­ously injured or killed by the pun­ish­ment. Prisoners would be kept in the stocks for sev­eral hours or even days and might be tor­tured as well has have all manner evil sub­stances thrown or poured over them. There were even finger and thumb stocks that were some­times used in schools and by employ­ers sus­pect­ing petty theft. Ducking stools were fre­quently used on women for such things as vin­dict­ive gos­sip­ing and pros­ti­tu­tion and entailed the com­plete immer­sion of the person in water sev­eral times. This was some­times fatal. Another pun­ish­ment for nag­ging and gos­sip­ing was the scolds bridle. In 1799 a man was placed in a bridle for 3 days and then was hanged. Ian’s talk con­tin­ued to cover cap­ital, prison and less obvi­ous pun­ish­ments. The talk is crammed full of really inter­est­ing detail and makes one real­ised how atti­tudes have changed over the past cen­tury. The last public behead­ing was in 1747 and the last removal of a head after hanging was in 1817 in Derby. Peter Ivey is a member of Stumperlowe Probus Club. He gained degrees in Physics at Bristol University before work­ing in BT Labs for 15 years. In 1989 he joined the University of Sheffield and left in2003 to run his own com­pany in design­ing micro­chips. His pre­vi­ous talk was an intro­duc­tion to micro­chip tech­no­logy and this talk covers what is spe­cial about silica. Whilst silica is an oxide of sil­icon and is a major con­stitu­ent of sand, sand is too impure for micro­chip use. The silica used is quartzite (sil­icon diox­ide SiO2) and it is mined. Oxygen is removed from the sil­icon using high tem­per­at­ure pro­ced­ures to pro­duce poly­sil­icon. The elec­tron­ics industry uses poly­sil­icon with impur­ity levels of less than one part per bil­lion. The poly­sil­icon is recrys­tal­lized to grow single crys­tal boules using the Czochralski pro­cess. It is then dia­mond cut into thin wafers using a “salami slicer”. These wafers are then buffed using very high powered phys­ical and chem­ical buf­fers to pro­duce the base for the chips. Peter then explained how a good insu­lator like sil­icon can become a semi­con­ductor. It has an atomic number 14. Four of its four­teen elec­trons reside in silicon’s outer shell and com­bine with eight other elec­trons form other atoms to form a tight bond. If a phos­phor­ous impur­ity (one part in 10 bil­lion) is intro­duced, Phosphorous has one more elec­tron than Silicon and this “spare” elec­tron can flow from neg­at­ive to pos­it­ive (N type). Boron on the other hand cre­ates a “hole” and per­mits a flow from pos­it­ive to neg­at­ive (P type). Electronic chip man­u­fac­ture is all about purity. The cir­cuits used in chip man­u­fac­ture use extremely fine pho­to­litho­graphy. Copper is the con­ductor used to fill the depres­sion cre­ated con­nect­ing the bil­lions of tran­sist­ors. There might be twenty layers of con­nec­tions all sep­ar­ated by insu­la­tion layers in a smart­phone chip the size of a thumb nail. There will be sev­eral miles of “wires” between tran­sist­ors in such a chip. The gaps between cir­cuits is so small that a single dust particle could cause a short cir­cuit. The need to pro­duce elec­tronic chips in such a pure and clean envir­on­ment means that the factor­ies are incred­ibly expens­ive and are few and far between. They pro­duce chips to cus­tom­ers’ designs. Whilst the man­u­fac­tur­ing machines are enclosed in a very pure envir­on­ment, they require fre­quent main­ten­ance, so the sur­round­ing envir­on­ment must also be as clean as pos­sible for when the engin­eers access them. An ordin­ary atmo­sphere could take weeks to clean to the required level for the machines. Peter’s talk was a bril­liant insight into a world at the core of our modern exist­ence. He guided us through quite com­plex tech­no­logy in a way that his audi­ence could grasp. He was inund­ated with ques­tions that means that no one was sleep­ing. An excel­lent talk!